with over 1000 Teslas repaired. Bring your Model S, Model 3 and your Model X! including I-CAR GOLD CLASS® certification! Choose Precision Auto Works of LIC™ with confidence: all our work is GUARANTEED! MANUFACTURER CERTIFIED: ACURA, BMW, CADILLAC, FIAT, INFINITI, TESLA, VOLKSWAGEN and more. BRAND EXPERIENCE: ALFA ROMEO, AUDI, JAGUAR, LAND ROVER - RANGE ROVER, LEXUS, MASERATI, MERCEDES-BENZ, PORSCHE, & more! 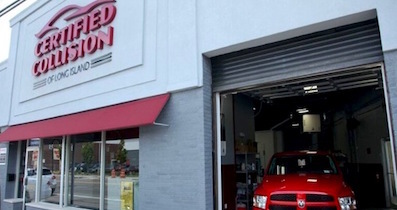 For over two decades, satisfied customers have returned to Precision Auto Works of LIC™ for our exceptional customer service, manufacturer certifications and flawless repair work. But don't take our word for it. Read our 5 star ★★★★★ Google reviews and facebook reviews and recommendations. Still not sure? Stop by to take a tour of the shop, meet our staff, and see firsthand the quality of our craftsmanship. We're here Monday through Saturday... and ready when you are. Precision Auto Works of LIC™ helps you get the safest and highest quality collision repair from your insurance company - at no extra cost! With training, tooling, equipment, certifications and years of experience not found at other body shops, we can return all your vehicles - including luxury and performance aluminum, high-strength steel, mixed metal and carbon fiber vehicles – to flawless condition! Call our Customer Service Team at 718-786-2923, option 2 with all your collision repair questions. Precision Auto Works of LIC is proud to be Tesla Certified since 2013 and NYC's first, most experienced Tesla Factory-Trained body shop. 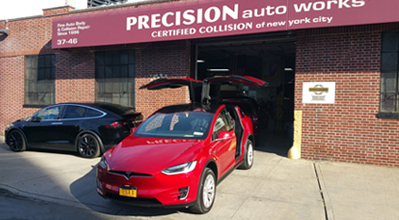 With over 1,000 Tesla vehicles repaired since 2010, we can state with confidence that no one in the NYC area comes close to our Tesla collision repair expertise. Call 718-786-2923, option 2 to start your estimate. As a VERIFACTS Automotive Excellence™ certified shop, you can be assured your vehicle will be "Repaired Correctly, Repaired Quickly, Repaired Efficiently" according to auto body industry best practices. BBB A+ Rating + Our Guarantee! We are also a BBB accredited and A+ rated business by the NYC Better Business Bureau because our customers come first. No fine print. No exceptions. Feel confident in your choice of Precision Auto Works and when you refer others to our shop, as we guarantee ALL OUR WORK! We are a Preferred Collision Shop for AIG, PURE and Allstate, and we accept all major auto insurance plans including: Cincinnati, Farmers, GEICO, MetLife, Progressive, Travelers and Zurich. Let Precision help you get the best repair from your insurance, at no extra cost. Call us at 718-786-2923, option 2, with all your auto insurance questions. Please note: online appointment requests must be confirmed by our staff. BUSINESS HOURS: WEEKDAYS: 8am-5pm. SATURDAY: 8am - 3pm. Closed SUNDAY.